When the University of Washington Press republished one of its most enduring titles with a new cover and introduction, editor Alan Lau of the International Examiner’s Pacific Reader section asked me to critique the new edition, to report on whether the book still stands the test of time after nearly 60 years, and what it says to us now. What I found was a jarring and misguided addition made by the Press to John Okada’s text, in its otherwise fine new paperback edition. ** UPDATE April 3, 2018: Through the magic of digital printing, the John Okada “signature” has now been removed from the Preface on new press runs of No-No Boy. Thanks to UW Press for its responsiveness to this issue. 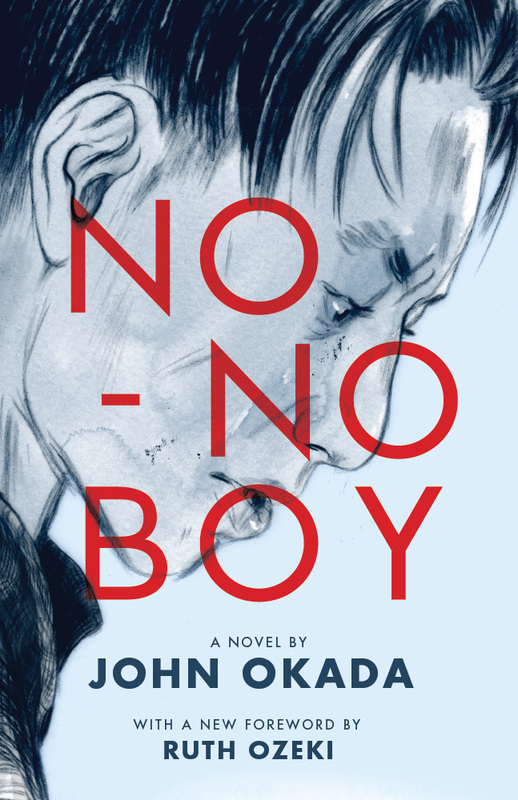 The appearance of the first new edition of John Okada’s No-No Boy in nearly 40 years offers the chance for re-evaluation of his work. As someone with a long connection with the novel, I find there’s much to like about the new edition – and one thing profoundly wrong. After more than 100,000 copies in 13 printings, the University of Washington Press has republished this foundational work along with five others in its “Classics of Asian American Literature” series, with new covers and introductions. First, the good. The new cover illustration reflects a lot of thought. I’ll miss the menace of the 1976 design by Bob Onodera of San Francisco, with the flags of the U.S. and Imperial Japan peering from the eyes of draft resister Ichiro Yamada’s surly face, partly because Bob based it on a photograph of myself taken the year before at the Asian American Theater Workshop. He designed the title with Army stencil font against a brown background that suggests the texture of a paper grocery bag of the kind used at Yamada grocery. Illustrator and cartoonist Jillian Tamaki of Toronto, whose own family was interned in Canada, gives the new cover the feel of one of her celebrated graphic novels and cartoons, a look that will draw in a new generation of readers. Seen in profile, the downcast distress in Ichiro’s expression updates the anguish of the unseen Ichiro clenching his fists to his face in the original 1957 Charles Tuttle hardback designed by M. Kuwata. The type has been completely reset. Designer Thomas Eykemans arranged his cover title to create what he calls a “tense visual ‘X’ that pulls the eye to the center before expanding outward,” while also suggesting the colors in the U.S. and Japanese flags. The new edition wisely retains the 1976 Introduction by Lawson Inada and the Afterword by Frank Chin, which continue to bookend the novel for readers unaccustomed to the facts of forced incarceration. Inada’s piece captures the personal thrill of rediscovering the book and setting in historical context its republication by CARP, the Combined Asian American Resources Project. Chin’s biographical essay, “In Search of John Okada,” frames the mystery surrounding our Seattle author and first revealed the heartbreak surrounding the burning of his unfinished second novel. This Afterword has been cribbed endlessly by two generations of students and scholars, and to this date continues to document the few known facts about Okada’s life. So here’s the problem with this new edition: At the end of the Preface, someone added the name “John Okada,” as if he had signed it as a statement from the author. This attribution never existed in the original Tuttle hardcover overseen by Okada, or the CARP paperback reprint. It was not authorized by the Okada family. It interrupts the dream woven by Okada’s fiction, and violates Okada’s artistic intent. The final voice in the Preface is that of a Nisei translator flying in the belly of a B-24, whom we hear in a terse exchange with a “blonde giant from Nebraska.” When asked how, with his family in camp, he could volunteer for the Army, the Nisei replies, “I got reasons,” and his thoughts go to his friend Ichiro who refused the draft until his family was freed. This passage ends the Preface and leads directly to Chapter One and Ichiro’s arrival by bus at King Street Station, with the cognitive dissonance of a narrative shift to Ichiro’s voice. Generations of scholars have carelessly misread the Preface and believed that Okada was inserting himself into it. But he’s not. The bit with the Nisei translator is certainly based on Okada’s experience as a radio message interceptor, but he erases any doubt as to what’s fact or fiction by having the translator reveal that his family is imprisoned in Wyoming. The Okada family, like most from Seattle, was evicted to Minidoka, Idaho. The Preface is part of the fiction. It’s not autobiography. Okada’s “signature” is a jarring and misguided addition that disrupts the narrative and should be removed from future editions. This editorial problem aside, No-No Boy continues to hold up today, 60 years from its initial publication. As geography, it’s a Rosetta Stone through which we can decode and piece together the bits of WW2 Seattle that survive for us today, from the rescued Wonder Bread sign on Jackson Street to the parts of Maynard Alley that will remain after demolition of the Wah Mee Club. The book is still the great Japanese American tragedy, whose power and authenticity derives from the unexpressed rage of his generation that Okada pours into his characters. He holds nothing back, and tries to please no one. After “two years in camp and two years in prison,” the resister Ichiro Yamada returns to find his Seattle community shattered and its people divided. Parents mourn sons lost in battle; veterans return maimed and succumb to their wounds; resisters are blamed and ostracized; a woman abandoned by her soldier husband finds comfort in Ichiro’s arms; his mother goes mad when forced to admit Japan lost the war and drowns herself. By novel’s end, Ichiro walks slowly away from a final violent confrontation that leaves one dead and another a drunken, sobbing mess, desperately searching in his mind for some kind of redemption from everything he’s seen – white racism, Pearl Harbor, and the war; mass eviction and incarceration based solely on race; and his own resistance that led him only to prison and social ostracism. Ichiro takes it all in, rendering him unable to pursue his American dream, and unwilling to settle for an easy answer. It may say something about our current sensibility that recent attempts to adapt this novel to the stage or screen consistently veer toward the easy answer of a love-conquers-all scenario involving Ichiro and Emi, the abandoned wife. But Okada places their final romantic encounter 40 pages and two chapters from the end of Ichiro’s journey. Through his brilliant organization of the material, Okada states clearly his artistic intent. He refuses the idea of a happy ending. Love is not enough. As Ichiro might say, “the problem is bigger,” and Okada makes it clear it is something that Itchy will have to fight through for years to come. At the time he wrote, Okada could not foresee how the Sansei would grow to take up the mantle of justice for the camps and redress, and make sense of the camp resistance. He could only hope something was coming. In the darkest part of the night for postwar Japanese America, even as Ichiro thinks and probes for answers not only for himself but for all those in his world, he can see “a glimmer of hope … a faint and elusive insinuation of promise.” And in that precise balance, and in the rigor of Ichiro’s arc, lies the greatness of this novel. No-No Boy stands the test of time. It’s still the great Japanese American novel. Flashback Friday: Thanks to JK Yamamoto, former editor of the Hokubei Mainichi, for reminding us that it was on this date 23 years ago that we staged the first ceremonial homecoming for the Heart Mountain Fair Play Committee. Under the sponsorship of Prof. Wendy Ng at San Jose State University, the May 29, 1992 event was a special evening program for the national conference of the Association for Asian American Studies, held in the Studio Theater of Hugh Gillis Hall. We called it “The Boys of Mountain View – San Jose,” and what lent it the ceremonial feel was the readers’ theater script compiled by writer Frank Chin that threaded together the original writings of the resisters, the editorials in support of the resisters by Rocky Shimpo editor James Omura, and a warm narration provided by poet Lawson Inada. Omura, Frank Emi, Mits Koshiyama, Dave Kawamoto, and Gloria Kubota read their own words from the time, from the scripts in the music stands in front of them. For a bit of dramatics we staged part of the interrogation of Frank Emi by camp director Guy Robertson, with Emi’s words read by the current editor of the Nichi Bei Weekly, Kenji Taguma. We shot the event with three cameras, thinking that cutting between them would provide the framework for a documentary about the resisters. But once we got the tape into the editing bay, we immediately saw the problem: all the readers were looking down at their scripts in the music stands, and making no contact with the audience. It just wasn’t visually compelling. That began an eight-year journey to shoot new interviews and gather archival film and stills for what would eventually become Conscience and the Constitution. The San Jose State homecoming was the first event we shot, and it turned out to provide the last shots in the finished film, with the applause from the audience and the recovery of their history providing an emotional lift to help cap our story. This 1970s-era novel by Frank Chin, published for the first time today by the University of Hawaii Press, predates his work with the Heart Mountain resisters who are the subject of this blog. But as a Friend of the Fair Play Committee, the surprise recovery and restoration of Frank’s unpublished first novel is a story as notable as his recovery of the buried history of the resisters. The emergence 40 years later of a tightly edited, slimmed-down version of a long-lost novel from the writer who first defined Asian American literature is an unexpected gift. That’s because to read The Confessions of a Number One Son in 2015 is to peel back the decades and discover the creative foundation of the plays and later fiction of Frank Chin, in the moment before he became consumed with the polemics of separating the real from the fakery in the work of others. 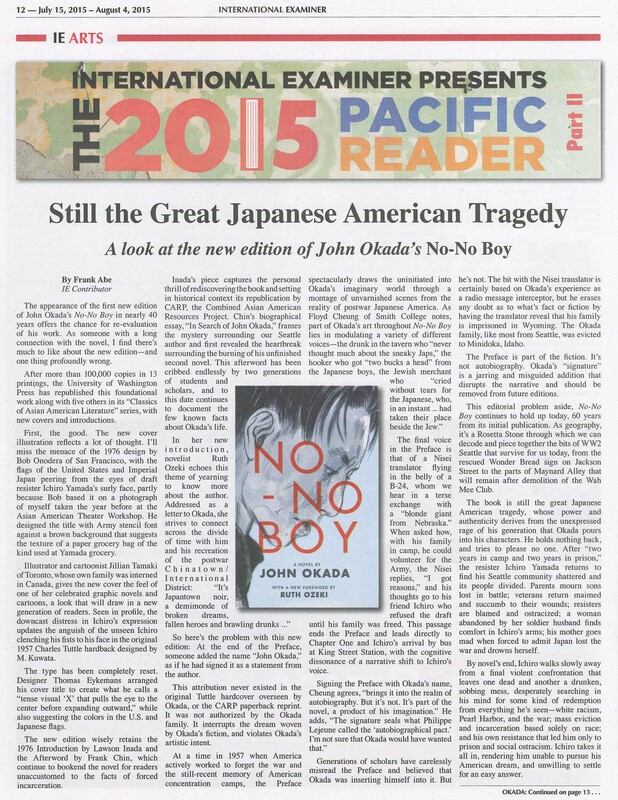 A headline first written by Frank Chin in 2010, “Don’t F**k With No-No Boy,” captures the insistence with which audiences should reject the recent stage adaptation of John Okada’s landmark novel No-No Boy. A New York theater company is now pitching a national tour. with stops in the Midwest and West Coast, of an adaptation of No-No Boy that violates the art of John Okada by tacking on an artificially happy ending to his story. After more than 100,000 copies sold in 17 printings over nearly 60 years, it is well-established that much of No-No Boy‘s power and authenticity lies in its furiously violent and tragic ending. Okada cuts to the bone. He holds nothing back, and most importantly he tries to please no one. After “two years in camp and two years in prison,” draft resister Ichiro Yamada returns to find his Seattle hometown shattered and its people divided. Parents mourn sons lost in battle; veterans return maimed and succumb to their wounds; resisters are blamed and ostracized; a woman abandoned by her soldier husband finds comfort in Ichiro’s arms; his mother goes mad when forced to admit Japan lost the war and drowns herself. Having fun yet? “Agggggggghh,” he screamed and, with the brute strength that could only smash, hurled the whiskey bottle across the alley. Then he started to cry, not like a man in grief or a soldier in pain, but like a baby in loud, gasping, beseeching howls. Ichiro walks slowly away from the scene, desperately searching in his mind for some kind of redemption for white racism, Pearl Harbor, and the war; the mass eviction and incarceration based solely on race; and the conscience that led to his own resistance, prison, and social ostracism. In the stage adaptation now being shopped, this vicious climax is muted and the unsettled ending is omitted. SPOILER ALERT: Instead, after a brief knife fight, Freddie escapes. Ichiro goes out dancing — a scene from earlier in the book, with Emi the abandoned wife and Ichiro alone on the dance floor, finding momentary acceptance in the indifference of the whites around them. And as they hold each other close on the floor, all the characters from the play, including the ghosts of those departed, REENTER the stage to offer final words, of blessing and hope for the future. Ichiro and Emi kiss. They are going to live happily ever after, doggone it. It’s a theatrical moment. It’s probably very moving in performance. It’s also schmaltz. And it’s very wrong. The problem with reading the end of No-No Boy with a strong sense of optimism, though, lies in the fact that … the ideological setting of postwar America provides impoverished imagoes from which to choose for Japanese American men. Neither the no-no boys nor the yes-yes boys are happy… The social context of postwar Seattle influences whether individual stories of identity will have the tone and content of a comedy, tragedy, irony, romance, or some other story form. To convey his vision of Japanese America after Pearl Harbor, the camps, combat, prison, and resettlement, Okada carefully constructs Ichiro’s social context to end with tragedy. To substitute romance at the end violates Okada’s story form. We agree. John Okada isn’t here to defend his work. This impulse to eschew the darkness that is the power of No-No Boy, and replace it with sentiment to leave the audience happy, is as old as Hollywood itself — a place where Mr. Narasaki has a background in writing coverage of screenplays for film producers. As a forthcoming study of John Okada will show, he was certainly capable of comedy, satire, and upbeat endings. If he wanted No-No Boy to end on a happy note, he would have written it that way. The evidence we have on the page extends to claimed representations of his work on the stage and the screen. Accept no substitutes. The bad boy of Asian American letters has done it again. The Manzanar Committee has discovered what the Organization of Chinese Americans and the Northwest Asian American Film Festival learned before them. The Manzanar Committee expresses their deepest apologies to those who were offended by remarks made by Frank Chin, one of the speakers at the 37th Annual Manzanar Pilgrimage. Though the intention and focus clearly communicated to Chin in the Committee’s invitation was to focus on his central role with beginning the annual Day of Remembrance and being part of a Pan-Asian movement that supported redress as well as encouraging youth today to become more politically aware and informed, Chin departed from this intention when he resorted to name calling against the Japanese American Citizens League and the 442nd Regimental Combat Team. These are views which may reflect those of Chin but not the Manzanar Committee. Read the entire, indignant news release from the Manzanar Committee.